This is the last of a series of articles about the first students to solo in EMU’s new aviation program. Meet the other six students in this history-making group by visiting the EMU at Lancaster news feed. 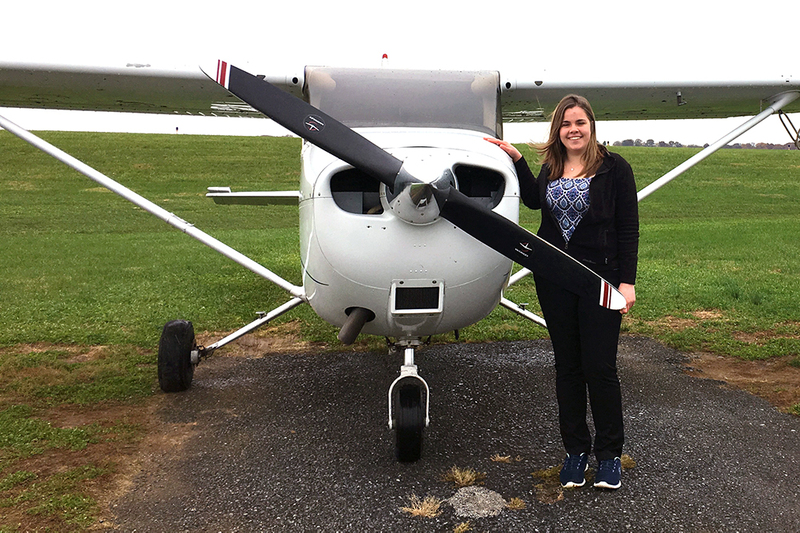 Noelle Yorgey – a junior transfer into Eastern Mennonite University’s new leadership and organizational management (LOM) bachelor’s degree program with a concentration in aviation – has completed her first solo flight. A resident of Fleetwood, Pennsylvania, Yorgey soloed on Nov. 9. Her flight instructor is Jon Glick. Why are you interested in aviation, and when did you make the decision that this was in your future? Since I was a sophomore in high school, I have had a growing passion for aviation. On vacation, my family and I were introduced to an aviation missions organization, Agape Flights. My interactions with the organization inspired me to consider aviation as a career. I have spent the past two years pursuing a business degree, but several weeks before business school resumed this fall, I learned of EMU’s business and aviation program. It could not have been more clear that this is what I was called to pursue, and I am so thankful for the opportunity! What was your first solo experience like? Soloing is a bit surreal. From day one, my instructor had been beside me in the cockpit. The day of the solo, he hopped out of the plane and that was the moment that I realized that this was real; I was going to fly the plane. In a word, soloing was rewarding. My classmates and I have been working so hard to prepare, and the moment you roll out and take off on your own, it proves that you have the ability to apply all you have been learning in real-life situations. Did you do anything special to celebrate this big step in your career? I told a lot of my friends and family! Why did you choose Lancaster at EMU for your professional preparation? Having pursued my business management degree at a state school for the past two years, I can honestly say that I never expected to be attending EMU. Once I heard of the aviation program though, I leapt at the chance to pursue my passion for aviation. What I found so valuable about this program was the organizational management degree I would be receiving alongside the aviation certifications. From what I have observed, this entire program is structured for my classmates and me to succeed. From a personal mentoring program to a pipeline agreement with Republic Airline, the staff at EMU have worked incredibly hard to establish a strong foundation for the first cohort of our program. What have you most enjoyed about the program? It sounds cliche, but flying has been one of my favorite parts of the program. One of the things that drew me to aviation was the challenge of learning everything I needed to know about the plane and world of aviation. It is really rewarding to walk into a lesson and be able to track my progress, as I begin executing various maneuvers. I also love my classmates. Getting your private pilot certificate in a three months is very fast, but knowing my classmates are on the same track is incredibly motivating. Another neat aspect of the program is that my cohort and I take classes with a lot of non-traditional students in our business classes. Once out of school, I would like to fly for the regional airlines. My long-term goal is to become a missionary pilot.